We didn’t spot this one at CES where the phone-like RMC30D and standard remotes were the only options, but it looks like Samsung has an alternative Bluetooth remote planned for its Smart TVs (but not any Google TV products judging by that Yahoo! button on the remote side) that features standard buttons on one side and a full QWERTY keyboard on the other, much like the Boxee Box’s remote. Judging by the ruler in the remarkably unflattering FCC photos, this one appears to be a bit larger and it’s not immediately clear what that display on the QWERTY side is for. Obviously, if there’s any chance users will be logging into their various Twitter or Comcast/Time Warner accounts on the TV they’ll need something better than T9 to do it, but we’ll have to wait to get our hands on this one to know if it’s an improvement. Check the gallery for a few more pictures, we’d expect some kind of announcement on the RMC-QTD1 before Samsung’s 2011 line of TVs hit stores. 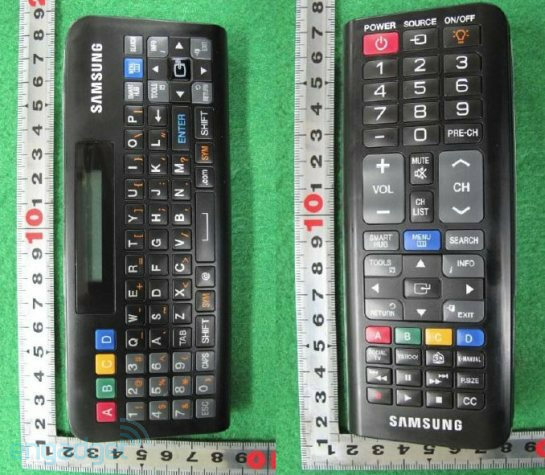 Samsung’s new dual-sided QWERTY remote for Smart TVs revealed by the FCC originally appeared on Engadget on Thu, 27 Jan 2011 23:39:00 EDT. Please see our terms for use of feeds.